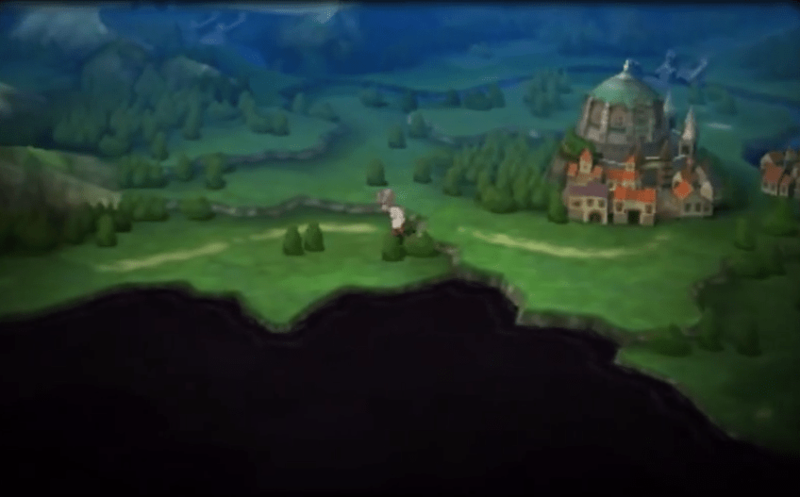 Bravely Default is the latest RPG from Square Enix, and the spiritual successor to Final Fantasy: The Four Heroes of Light. It’s been a highly anticipated game amongst fans of the JRPG genre and amongst our staff, as well. The version we got in the West was known in Japan as For the Sequel; similar to the original, but with some alterations and expanded content. The game has even done well enough in Japan to warrant a sequel. I think you’re all aware of the hype surrounding this game in the build-up to its release, and the hype still being felt across North America as they wait for another month. 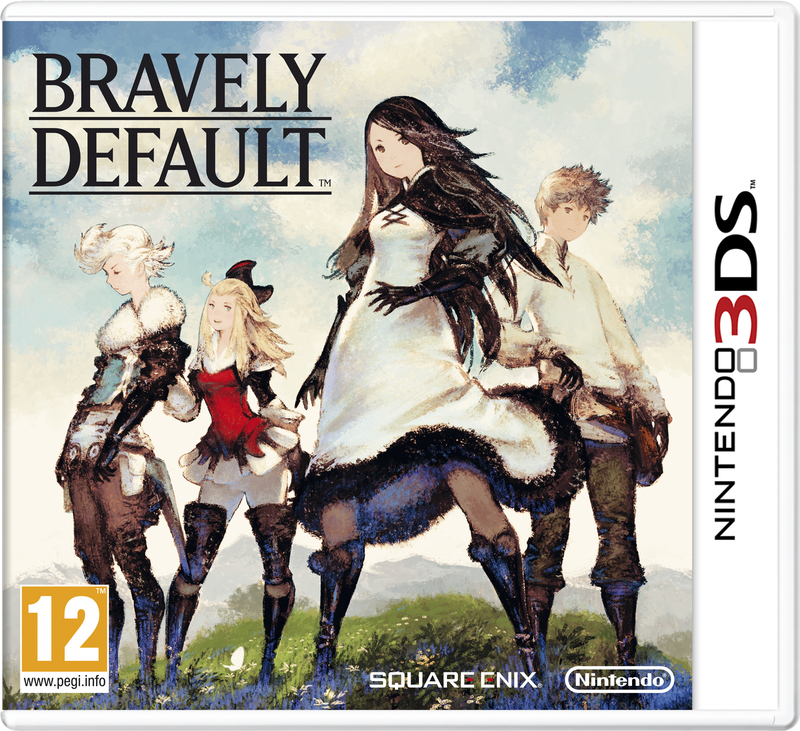 The question is: Does Bravely Default live up to it all? 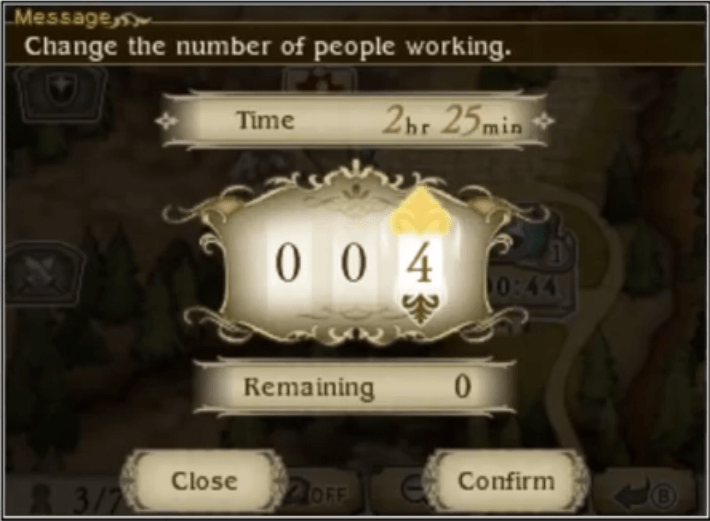 The game is set in the world of Luxendarc. The world’s four crystals have run afoul of monsters, and it falls to our four heroes to restore them to their former health. They must fight the forces of Eternia, who seek to control the crystals for reasons unknown. Agnès Oblige is the vestal of wind; vestals guard each of the crystals of wind, water, fire and earth. As you may have guessed, Agnès is tasked with the protection of the wind crystal. Tiz Arrior’s village of Norende was swallowed up by what was dubbed the “Great Chasm” in the game’s opening cutscene, and journeys with Agnès to both protect her and restore his village. Ringabel lost his memories a week prior to the game’s beginning. He carries only a journal which features a “D” on its cover, and tries to seduce every woman he meets. The daughter of the Grand Marshal of Eternia, Edea Lee starts the game opposing the party, but quickly turns against her commander, disgusted by his behaviour. The party is a likeable bunch, and the plot is interesting. It can be predictable at times, but it still managed to throw out a few twists which caught me completely off-guard. It’s fantastic watching the development as each of the characters grows in their own way, especially Ringabel as he regains his memories. 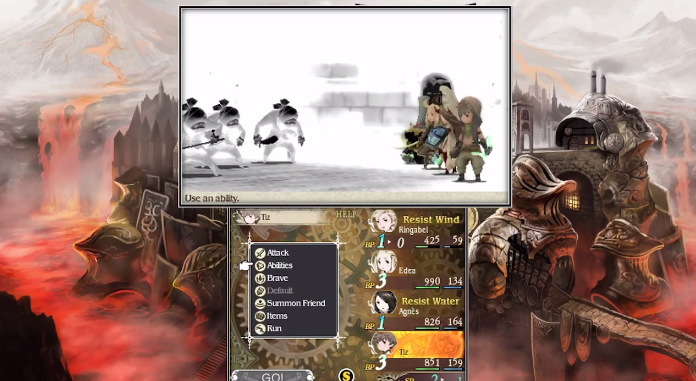 As a side note, Bravely Default supports dual audio. I am one who generally prefers to listen to English voices, but even I found myself swapping to the Japanese ones. The English dub is not completely terrible, but it’s still not very good. In addition to all of these are the Brave and Default options from which the game draws its name. Default works just like “defend” in other RPGs, but also gives your character one BP. Brave will consume this BP in exchange for an additional attack that turn. Up to three BP can be stored up or consumed in a single turn, and, if you lack the necessary BP, you can still have an advance turn or two or three. Should your BP drop below zero, however, you’ll have to wait for it to return to zero before you can attack again. So, it can be quite risky, but well worth your time once you master it. The ‘send’ option is found under ‘Summon Friend.’ This screenshot also shows how the battle screen looks when you freeze time using SP, which I’ll discuss in the next paragraph.